Thanksgiving is next week so we have another wonderful (and easy!) fall recipe from Josephine Wennerholm of Frascati Cooking That's Amore (and Giardini di Sole) with which to grace your holiday table. This recipe is one that Jo created here in the Giardini di Sole showroom for a Roman themed event a few years ago. With no cooking facilities within the showroom itself, the recipe had to be a) portable, b) Italian and c) crowd-pleasingly good. We came up with the idea of adapting Marlena di Blasi’s recipe for ‘Zucca al Forno’...the link to this original recipe is provided at the bottom of this post. pumpkin weighing between 2 ½ -3 pounds. 1. Chopped onions need to be cooked in plenty of butter. 2. Cut up mushrooms are then added to the onions after about 5 minutes. 3. Trim the slices of bread of their crust. 4. The bread needs to be transformed into croutons by frying it in plenty of butter. 5. Combine the cooked mushrooms, grated Emmenthaler, Parmesan, freshly grated nutmeg, Mascarpone and the eggs. 6. Taste the mixture and add salt and pepper to preferred taste. 7. The pumpkin requires three layers of this mixture, plus two layers of the croutons. Divide cheese mixture into three equal portions. Divide the croutons in two portions, one for each layer. 8. Draw a ring around the top of the pumpkin. This will make it easier for you to cut the top of the pumpkin off. You will need a sharp knife for this and lots of patience as well as strength. Take your time and be safe! 9. All the seeds and stringy bits have to be removed. 10. And here is our emptied out pumpkin (well, yes, a few seeds were left … who cares), acting as a vessel for all the goodies that are now going to be filling it. 11. The first layer goes in followed by the first layer of croutons. Continue with the second & third layers. 12. Place top back onto the pumpkin and pop into the preheated oven, bake for 1 to 1½ hours. Ovens are irritatingly quixotical in their design so you will have to judge for yourself when the pumpkin is indeed ready. We transported the pumpkin to the showroom wrapped in plenty of aluminium paper. Here I am about to ‘unveil’ this beauty (which had just been warmed up in a countertop toaster oven). And here it is in all its glory. And yes … nothing was left by the end of the evening ! 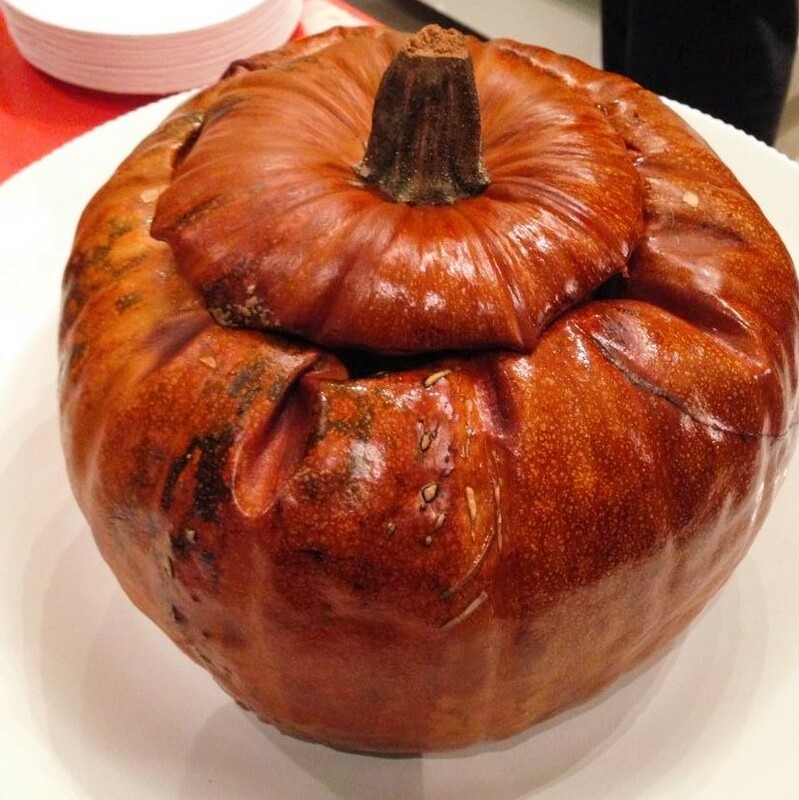 (Whole Roasted Pumpkin Stuffed with Porcini and Truffles) by Marlena di Blasi from her book, A Thousand Days in Venice: An Unexpected Romance, published by Virago Press.